A day trip to Monaco was the next thing on our agenda. 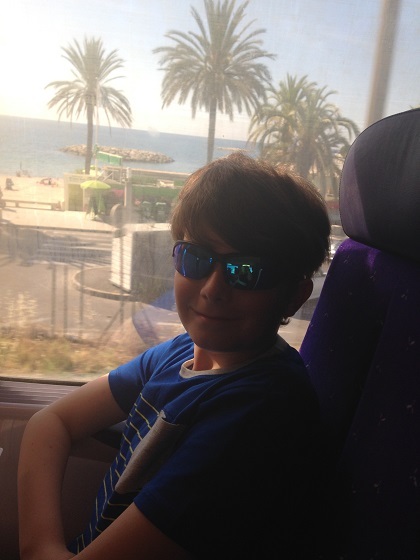 We took the train – a fast and regular service that passes once an hour through Cannes, Nice, Menton and on to Monacco. We had our pick of seats as we climbed onboard, as it passed through the centre of Cannes and onto Nice it became more and more busy with standing room only. The train stopped for a short time in Nice then we were on our way again. A stunning stretch of coastline from this point on with the mountains, the sea glistening and twinkling with its many shades of blue and loads of people sunning themselves on the beaches. The odd luxury yacht bobbing about here and there completed the idyll. One hour later and we arrived in Monaco. We emerged from the train several levels below ground so joined a queue to take the lift up a few levels. We stopped briefly at one of the terrace areas to check out that view. Coming out from the station we realised everyone else must have found a better route, we were the sole people on the street. 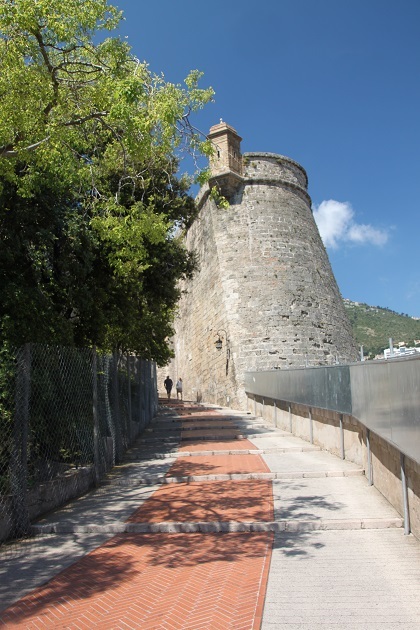 We later discovered there is an underground walkway linking the station to Monte Carlo – walking made easy, that would have eliminated our hill hiking in the fierce sunshine. We found it on the way back – it made life so much easier. We arrived late morning and made our way first to the Royal Palace, keen to watch the Changing of the Guard. 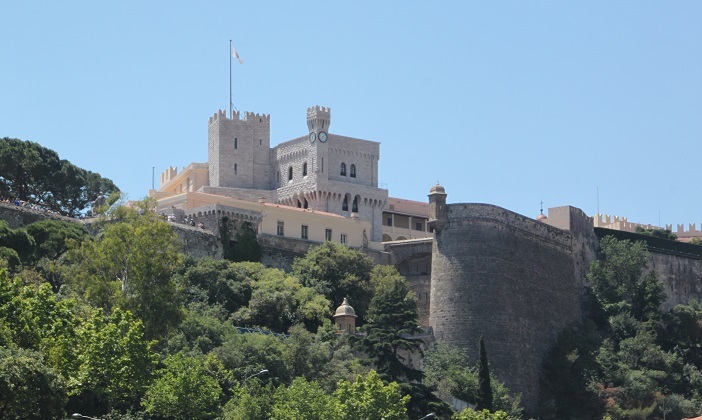 You can spot the palace from a way off, it is part of the old town and sits on a promontory called “The Rock.” It is a lovely yellow building, still home to the royal family. 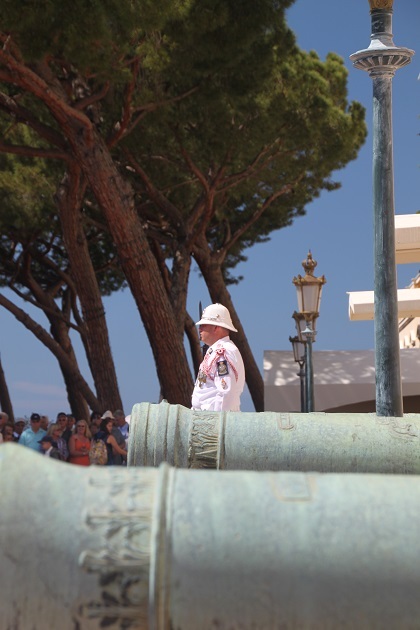 We raced up a steep hill and a gazillion steps, sweating, huffing and puffing to reach the top before the Changing of the Guard at 11.55. We made it with five minutes to spare but still managed prime viewing spots. Children were allowed to sit in front of the barrier which was great for Son. It was so incredibly hot and with not an ounce of shade to be had, I was seriously considering seeking much needed shelter from the sun and leaving my prime spot – five minutes of this was long enough for me and relief was my feeling that we had not arrived earlier. The sound of the drums and trumpets that signaled the start of the guard change was definitely music to my ears. The guard change took about ten minutes, involved some marching around and about a dozen soldiers as well as a couple of drummers and trumpet players. Not on the scale of some guard changes I’ve seen but impressive nonetheless and I would have felt we’d missed out had we not experienced this. 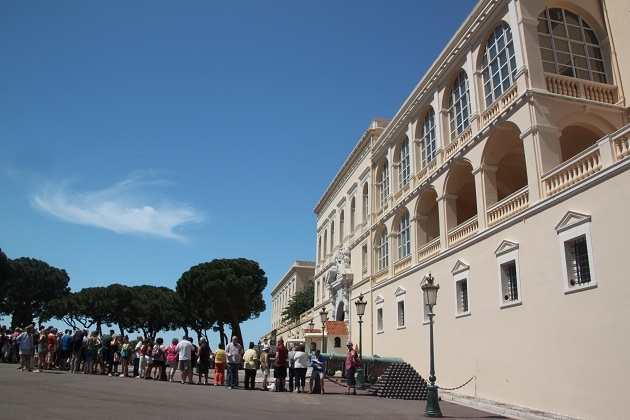 The crowds dispersed quickly and we used this chance to take some pictures of the palace and have our lunch. We ate this in a shady place, just across the road disturbed by some aggressive seagulls and pigeons who would not take no for an answer, then wandered through the old town. 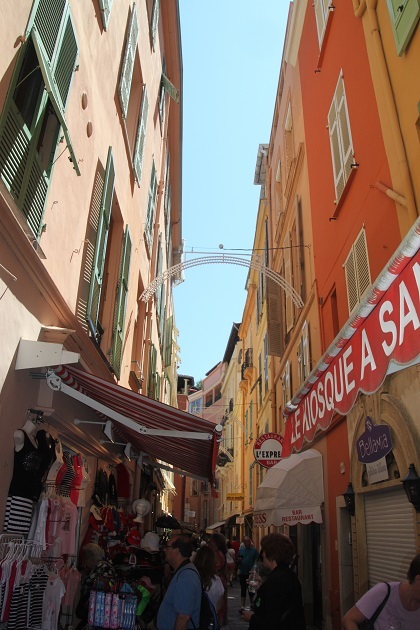 This is the only part of Monaco to have retained small, winding, medieval streets and lanes. Picturesque for sure – the rest is a bit of a concrete jungle – but the souvenir shops and ice-cream parlours were (in my opinion) especially tacky and let the whole place down. 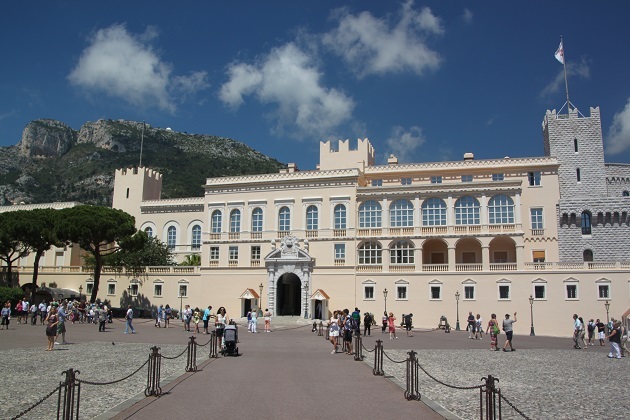 It is pedestrianised and some of the previous century houses still remain but we didn’t linger too long, keen to make our way to the cathedral – one of my Monaco highlights. It was interesting and fun – thank you for reading and commenting! 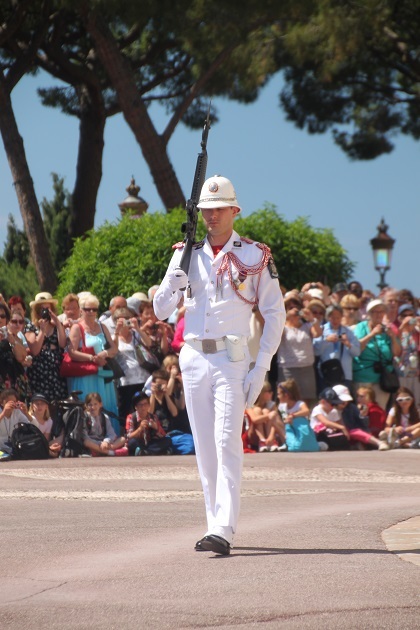 Never knew of a change in guard in Monaco! We’ve been before but never managed to see it – this time I was determined we would!! 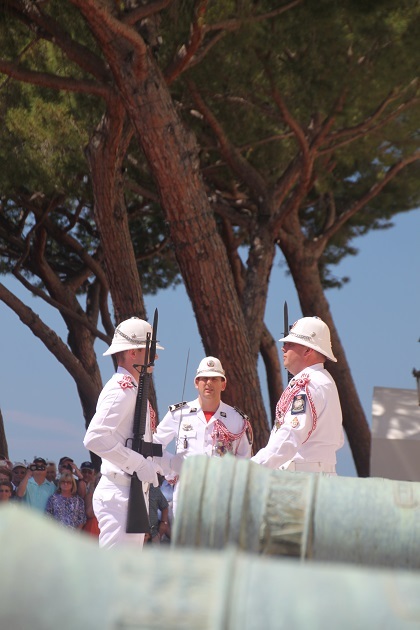 Never knew there was change of guard in Monaco also! 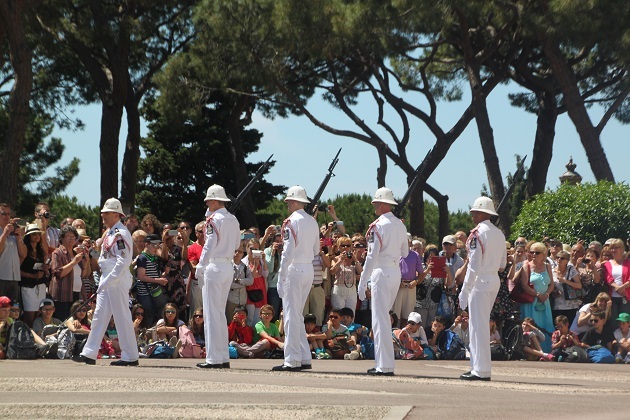 So pleased you managed to see the changing of the guards, we enjoyed it as well! I love Monaco and one time we were there it was just before the Grand Prix so we walked the circuit and and saw all the stands and how they had transformed the roads, it was really fascinating. The last time (before this trip) we went to Monaco was just after the Grand Prix, needless to say my husband was beside himself with excitement. We walked around but saw them dismantling everything which was also really interesting. Never managed to see the Changing of the Guard before so I was determined we would do that on this trip! Wow, cool! 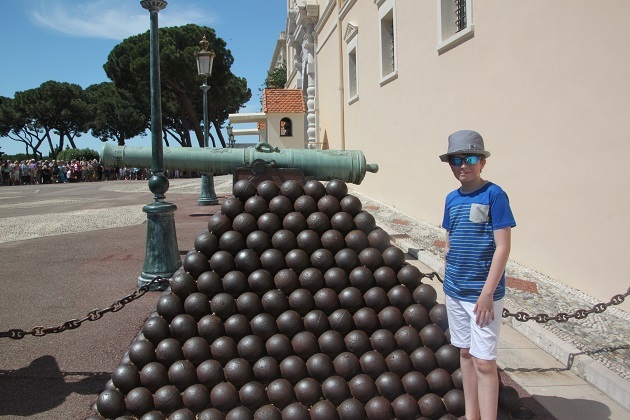 I have been to Monaco but did not make it to the castle. Thanks for taking me there now! It’s a lovely area to visit Erika, high up so great views to the sea but the palace area is interesting and very beautiful. It is! I loved the curvey road down to the city. 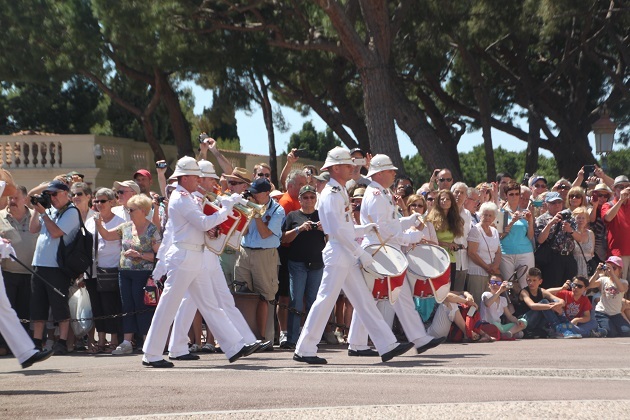 So awesome to learn that in Monaco they also have a Changing the Guard ceremony! I’ll keep that in mind because I hope to go one day! It’s great to see – recommend it and hope you make it there! That would have been impressive! Did you see any famous people? No – or not that we recognised!! I actually have know idea what to expect of Monaco – concrete jungle, winding cobbled streets etc. – so thanks for sharing your experience of it. It’s a mix of all those things – fast, furious and full on as well. 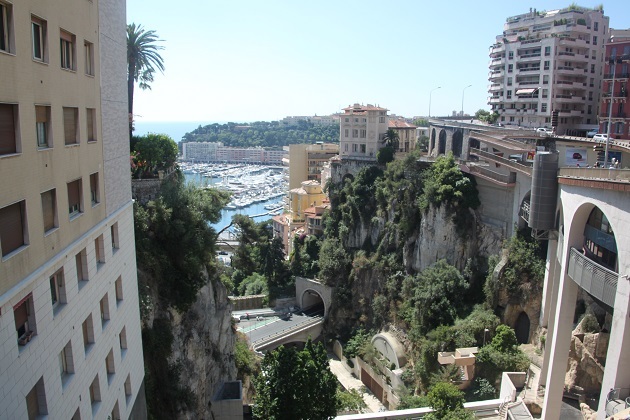 I actually have no idea what to expect of Monaco – concrete jungle, winding cobbled streets etc. – so thanks for sharing your experience of it. Have only been through Monaco by train a couple of times Joy en route from Italy to France and can’t really remember much about the route. I think it would be the sort of place to go on a day trip like you did as I think it’s incredibly expensive to stay there!! I’m glad you got to see the changing of the guard and think their uniforms are very stylish but it does look extremely hot!! The views must be stunning from the top! It’s a great place for a day trip Rosemary but I don’t think I would really want to stay there – all too fast and furious for me really. We enjoyed our day out but my heart lies in those lovely little hilltop villages – must be getting old!! I’m the same Joy – definitely prefer quite pretty hilltop villages than fast paced towns and cities these days!! I’m sure I’m getting old too as I would never have said that a few years back!! Joy, I have seen the changing of the Guard and walked the streets in the relentless sun! Thanks for taking me back again! I did find a delicious crepe up on that hill! It’s something special to see isn’t it Pam – although the sun, well for us England folk not something we’re so used to and I don’t cope that well!! 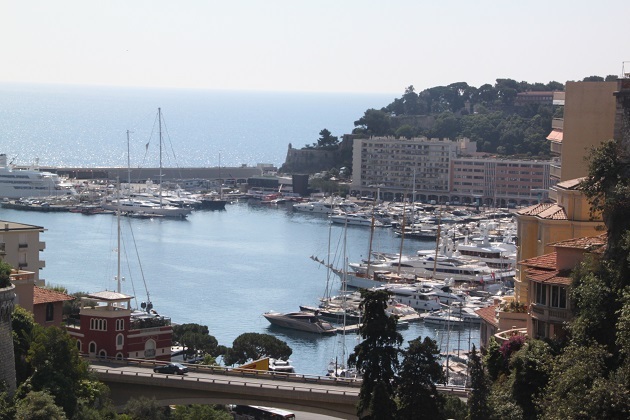 Aaahhh..day trip to Monaco sounds heavenly. Up there on the list for me! It’s full of interesting things to see, a bit fast and furious but we enjoyed our day there. I’d been before George but not seen the guard change so it was nice to catch it this time – so hot though!! Yes the shops were really touristy and not so great but it was lovely to wander around those little streets too. Oh yes – there are plenty of those for sure! Monaca seems like an interesting place to visit ! There’s lots to see and do, we enjoyed our day there but it is a hectic sort of place – I was glad to escape at the end of the day!! Monaco seems a bit surreal but I would love to experience the craziness at least for a weekend !